High profile mixed-use retail and residential developments in the heart of Rotherham town centre have been acquired in a multimillion pound deal. 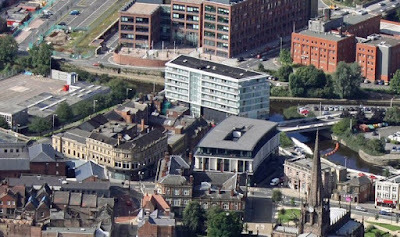 GVA's Leeds office has completed the sale of "Rotherham Central" on behalf of client and original developer, Iliad, in a deal worth close to £4m. Purchased by Modernistiq Developments, the sale comprised 61 private-rented apartments and 23 retail units, distributed across three buildings, including the Victorian Imperial Buildings shopping arcade. Rothbiz reported in 2017 that a portfolio containing part of the developments in had gone on the market. The Westgate Demonstrator Project saw developments like the Old Market and Keppel Wharf brought new apartments to the riverside. The scheme, part of the much-vaunted Rotherham Renaissance programme, also included the restoration of the Victorian, Grade II listed, Imperial Building. Income is derived from residential, retail, car parking and ground rent totalling £470,000 per annum. Alex Sweetman at GVA, said: "We are delighted to conclude the sale of Rotherham Central as the scheme will play a pivotal role in the revitalisation of the town centre. "The town is experiencing a healthy demand for high quality, PRS housing and with limited stock on the market, Rotherham Central presented a fantastic opportunity for potential purchasers. "The deal was a fantastic start to the year for us and we anticipate a busy few months ahead." Eversheds acted on behalf of Iliad, while Shoosmiths James Bielby of Bielby Associates represented Modernistiq Developments. Modernistiq is already looking at its investments and recently submitted a planning application to convert the vacant commercial unit at Keppel Wharf into 13 residential properties. Why are we building more shops and flats to simply go to people on benefits? Majority of the flats built years ago adjacent to these are now being rented to people on benefits? Private buyers will want parking for at least one car, where are all these cars going to be parked? On the other side why are we building more shops? The amount of shops closing out weighs those that open, retail is a terrible industry to be in at moment, high street shops are closing at an alarming rate. We need to increase the footfall to the town center, in my eyes good grade A office blocks at good market rents for business will attract businesses to move, this in turn brings in workers. The workers on their lunch pop out grab a bite to eat and then pop into one or two shops, which then will attract better shops, rather than betting shops, pawn shops and second hand shops, you never know increasing footfall might lead to M&S coming back to Rotherham.